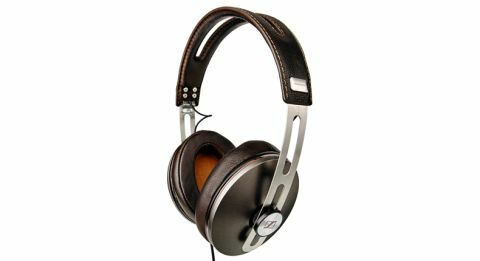 Sennheiser Momentum 2.0 Over-ear review | What Hi-Fi? When Sennheiser first announced the (now triple-Award-winning) Momentum 2.0s (or M2s as they’re called in some quarters) in early 2015, we were intrigued by how they planned to tinker with what was already a winning formula. After all, the company really struck a chord with the original Momentum headphones. They brought a level of style, refinement and sound quality that was extremely tough to beat at the money. The only issues with the original Momentums were a slight lack of portability compared to some rivals and the fact they came with a bulky carry case. So guess what? Sennheiser has addressed this by simply adding a couple of hinges, making them foldable and easier to store. The knock-on effect is that they’ve been able to wave goodbye to the old chunky case too. But a new folding design is just the tip of the iceberg. The biggest changes are to the earpads and earcups, both noticeably larger on this model, the Sennheiser Momentum 2.0 over-ear headphones. The new design does a better job of enveloping your ears and they’re also asymmetrically shaped to further enhance the fit. Going up in size does add a bit of extra bulk, but the benefits are better noise isolation and an even higher level of comfort, especially for those who wear glasses. We think the changes have been well worth it. As well as new earpieces, the headband has also had a tweak. It still uses high-quality Alcantara, but the band itself now has a more rounded profile and sits closer to your head. There are a couple more subtle tweaks elsewhere too. The eagle-eyed amongst you will notice that the headphone cable now runs out of the right earcup instead of the left. Not that it makes a huge difference, but it’s something to bear in mind depending on which pocket you keep your phone in. The in-line remote has been redesigned - it’s now smaller and made out of black instead of silver plastic. Also, the 3.5mm jack is now fixed, as opposed to being hinged on the original Momentums. It would have been nice to keep these little flourishes and touches on the new design, just to complement the premium appearance of the actual headphones. The brown finish is exclusively for Apple device users, who also get to choose from the ivory and black finishes also available to Android and Windows fans. The 2.0s come in two flavours, the AEi for iPhone users and the AEG for the rest. According to Sennheiser, the drivers inside the earcups remain the same, but the earpad coupling allows for less bass leakage. Although the general character hasn’t drastically changed, a quick blast is enough to tell you that the quality level has gone up. They lavish you with greater detail and insight, sounding more confident and stopping and starting with greater precision. Play The Temper Trap’s Sweet Disposition and the rolling guitar plucks show clarity and nuance. Drum kicks and vocals have definition, as each element knits seamlessly together. Switch to Drake’s Started From the Bottom, and the Sennheisers have no trouble serving up weighty bass. The headphones do a great job of communicating the different tones to the tune’s bassline. Classical music is welcomed with open arms too. There’s a beautiful ebb and flow to La Traviata, Act 1. Strings rise and fall dramatically and dynamically as the Momentums show their flexibility and fluidity. Timing is spot on and there’s a great balance of energy and finesse that keeps you listening. There’s always an element of concern when a manufacturer takes a much-loved product back to the drawing board, but far from adopting an “if it ain’t broke…” mantra, Sennheiser has managed to build successfully on everything we loved about the originals. They’ve retained their looks, but now boast extra portability and improved sound quality – it's what made them What Hi-Fi? Award winners for a third year running. As far as premium portable headphones are concerned, the Momentum 2.0s tick all the boxes, and then some.